Women are and always have been special to the Savior. On this Sunday, instill in women that they matter to Christ, to the church, and to the world. Without the presence and labor of women, all churches would close. The practices and policies of churches speak loudly to women about whether they matter. Sexist church practices, including those practiced by women against women, lessen the belief by women that they matter to Christ and in the world. The church must not perpetuate such thinking. Make the service women-friendly. Let women lead in carrying out the service if that is their preference. Have women participate in the planning of the worship service. Display pictures of women in the church (young and old) on screens throughout the service. Gather all women of the church during altar prayer and have a special time of consecration. Three weeks prior to this service during Bible Study (including Bible study for teen girls) and Sunday School, include books and films for and about women. Today, O Lord, we honor black women—carriers and cultivators of culture. In a lush African garden, your hands fashioned her as Mother of Creation. Bless her now as she continues to pass culture on to future generations. Thank you for black women, Lord. Their descendents have blessed the earth. We remember some of the African queens: Hatshepsut, Nefertiti, Makeda, Nzingha, and Yaa Asantewa. Through the centuries they grew in wisdom and strength. Fertile minds were formed at their knee. They nurtured kingdoms as queen rulers of mighty nations. Bless black women now, Lord, as they continue to educate and lead their people. Strengthen black women, Lord. Their genius has enriched the earth. 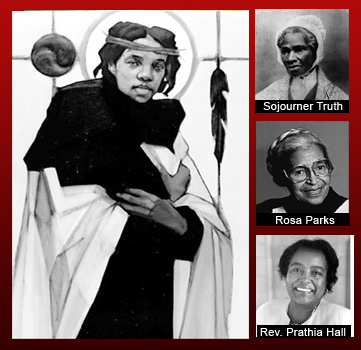 We remember Harriet Tubman, Sojourner Truth, Pauli Murray, and Rosa Parks. The black woman was treated as property during enslavement and the Middle Passage. Yet she survived and her vision of freedom ignited a determination to struggle for human and civil rights. Bless black women now, Lord, as they fight against injustice through strategies for hope, survival, and advancement. Empower black women, Lord. Their bravery has ennobled the earth. We remember Augusta Savage, Katherine Dunham, Marian Anderson, Mahalia Jackson, and Meta Warrick Fuller. They birthed black literacy and artistic traditions. Through autobiography, quilts, sculpture, dance, song and poetry, the once muffled voices of black women ring clear with creative power. Bless them now, Lord, as their moans and hums, whispers and shouts make our land beautiful. Inspire black women, Lord. Their beauty has adorned the earth. We remember Rahab, Zapporah, Jarena Lee, Julia Foote, and Zilpha Elaw. Black women prayed and preached, healed and helped faithfully at all times. As prayer warriors, they knew how to trust you, O God, especially in times of trouble. Their triumph has sparked fire in our souls. May the light that radiates from you today cast beautiful patterns on our lives through them. We rejoice now, O Lord, with black women everywhere. Thank you, Lord. Their work blesses the earth. (c) Savior, More Than Life to Me. By Fanny J. Crosby. Tune, (MORE THAN LIFE), by William H.
(c) We Bless Your Name. By Nolan Williams, Jr.
African American Heritage Hymnal. Chicago, IL: GIA Publications, 2001. #70. Used with permission. Rizen. Rizen, Vol. 2. Nashville, TN: Artemis Gospel, 2005. Just The Beginning. New York, NY: Zomba Records, 2008. The Full Gospel Baptist Church Fellowship Mass Choir. Embracing The Next Dimension. Nashville, TN: Light Records/Tehillah Music Group, 2008. Full Gospel Baptist Fellowship Mass Choir. Daughters of the Promise. Nashville, TN: Light Records, 2003. Hudson, Jennifer. Jennifer Hudson. New York, NY: Arista, 2008. God’s Property. God’s Property. Santa Monica, CA: Interscope, 1997. Headley, Heather. Audience of One. New York, NY: EMI Gospel, 2009. Sapp, Marvin. Thirsty. New York, NY: Zomba, 2007.
inSpiration. Washington, D.C.: NEWorks Productions, 2006. Wright. Timothy Rev. & The New York Fellowship Mass Choir. Jesus, Jesus, Jesus. New York, NY: Koch, 2007. Bynum, Juanita. A Piece of My Passion. Atlanta, GA: Flow Records, 2006. Adams, Yolanda. Yolanda: Live in Washington. New York, NY: Verity, 1999. Parham, Bruce Rev. Hide Me. Middleton, D.C.: S. Ford Music, 2004. Mighty Wind. New York, NY: Zomba, 2006. Chicago Mass Choir. Project Praise: Live in Atlanta, 2005. Adams, Yolanda. Day by Day. New York, NY: Atlantic Recording, 2005. Gilkes, Cheryl Townsend. If It Wasn’t for the Women…: Black Women’s Experience and Womanist Culture in Church and Community. Maryknoll, NY: Orbis Books, 2000. Higginbotham, Evelyn Brooks. Righteous Discontent: The Women’s Movement in the Black Baptist Church, 1880–1920. Cambridge, MA: Harvard University Press, 1994. Weems, Renita. Just a Sister Away: A Womanist Vision of Women's Relationships in the Bible. Nashville, TN: Publishing Editing Network, 1988.